In just a week schools will be full of kids running the halls. 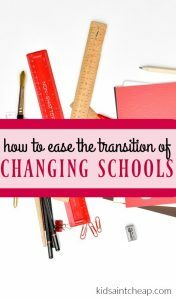 Though I always remember it being an exciting time of year, for some kids it can be an incredibly stressful time, especially if they’re moving to new school for the first time. Whether you’ve moved and starting fresh or you’re a brand new kiddo getting ready to embark for the first time, certain things can certainly ease the stress of starting a new school. Young children will be placed in an entirely new environment for the first time. It is important to ease their mind in as many ways as you can. Read books about school and reinforce that it is a safe and exciting place to go. There are a lot of great books (The Kissing Hand and the Berenstain bear stories come to mind) that will give the child a good idea about what to expect. If you’re able to get into the school a few days before classes start it may be a good idea to walk the halls and give them a layout of where things like the principal’s office is, for reassurance. Make sure they have any medication they may need (especially something like an epipen) and a list of phone numbers where you can be reached (though the office will also have these numbers in case something happens its nice knowing your child has access themselves). Older kids moving forward in grade school may already have the safety net of a group of friends moving on with them. This alone may be enough to make the transition easier for them. If they’re old enough to have their own cell phone makes sure they know when to use it (no playing with it in class!) and make sure their contact list is again updated with all important numbers. Though having mom and dad’s work number isn’t the top contact priority for a young teenager, if there was even an emergency that they needed to get in touch with you they will need it. My biggest transition period was definitely moving onto university. Moving from the comforts of four walls to a huge campus was a big adjustment. Just like I did on a tour when starting primary school, my mom, an alma matter to my university, spent a day with me walking on campus and point out where everything was. I already had my class schedule so was able to walk up to each classroom and know exactly where it was so I didn’t waste any time getting lost in those first few days. I also located other important things like library, student union, student services and university security, covering all my bases. I was much more comfortable on my first day of classes given I had some basic knowledge of the campus before-hand. Change is scaring especially when totally leaving your comfort zone. Though kids get the hang if things pretty quickly it’s always nice to prepare them in any way we can. They’ll thank us later.